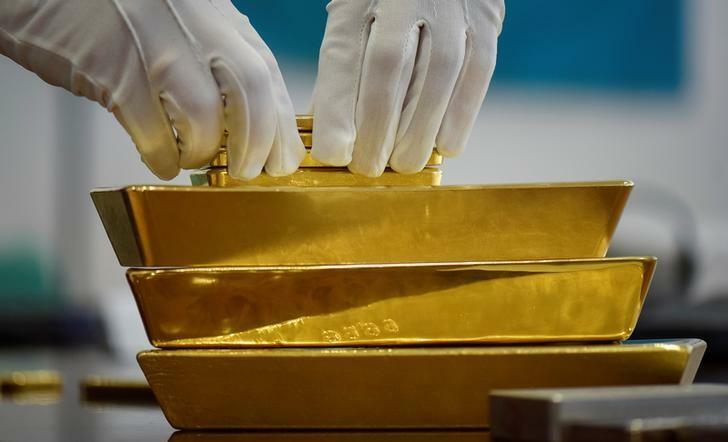 (Reuters) - Palladium jumped above the $1,500 per ounce mark for the first time on Wednesday, propelled by a stark supply deficit, while gold steadied near a 10-month peak as doubts lingered over future rate hikes after the U.S. Federal Reserve released its minutes. Spot palladium, which traded as high as $1,502 per ounce, was up 0.6 percent at $1,488.50 at 3:49 p.m. EST (2049 GMT). "Palladium's deficit is likely to persist for at least the next couple of years and there's limited opportunity to ease the market's tightness," said Suki Cooper, precious metals analyst at Standard Chartered Bank. Leading autocatalyst manufacturer Johnson Matthey said last week that a persistent supply deficit in the palladium market was likely to widen this year. Tighter emissions legislation means "palladium loadings continue to rise, offsetting weakness we've seen in auto sales," Cooper said. "Demand remains strong and we haven't seen an increase in mine outputs." Further, a broad-based substitution from palladium to platinum was not immediately feasible, analysts said. While both metals are primarily consumed by carmakers in catalytic converter manufacturing, platinum is more heavily used in diesel vehicles that have fallen out of favour since the Volkswagen emissions-rigging scandal broke in 2015. Unlike platinum, palladium has also benefited from a switch to petrol engines and expectations for growth in hybrid electric vehicles, which tend to be partly gasoline-powered, helping cushion the metal from falling global car sales. Meanwhile, spot gold edged 0.1 percent lower to $1,339.56 per ounce, having slipped about 0.3 percent soon after Fed's minutes showed U.S. economy and its labor market remained strong, prompting some expectations of at least one more interest rate hike this year, propping up the dollar slightly. Also, the policymakers gave little sense of how long their "patient" stance on U.S. interest rate policy would last. "The Fed came out with everything that everybody thought they would come out with but with some restraint. That restraint sparked a minor proft-taking (in gold)," said George Gero, managing director at RBC Wealth Management. The bullion was however trading near a 10-month peak of $1,346.73 scaled earlier in the day. U.S. gold futures settled up 0.2 percent at $1,347.90 per ounce. Gold will continue to do well since there are enough global worries, political and economic, to prompt investors to seek additional havens if the stock markets start to slowdown, Gero added. Spot platinum climbed 0.8 percent to $824 per ounce, and silver gained 0.6 percent to $16.07.